You don’t need fruit to make your infused water sweet and tasty. Instead, try herbs! The best thing about this mixed herb water is that you can pick a variety of what’s available in your garden and come up with a delicious infused water every time. The trick to herb-infused water is threefold: 1) tear any fleshy leaves like mint or basil to release their oils, 2) let the water infuse for at least 6 hours, and 3) serve it cold! You also will want to go easy on the rosemary as it can dominate the flavor. 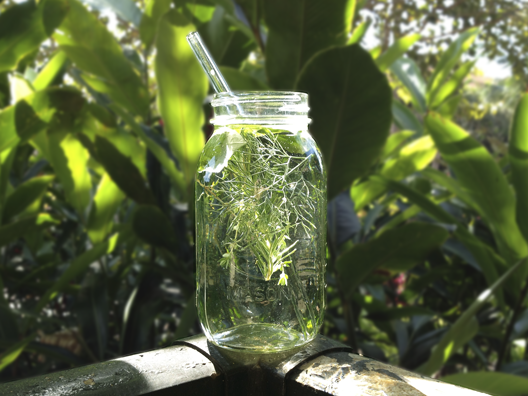 Recipe for a 32 oz Ball jar (pictured with an amazing Glass Dharma Straw): 3 leaves basil, torn, 1 small sprig of rosemary, 2 sprigs dill, 1 spring lemon thyme. You can also add mint, sage, lemon verbana, etc. Sky’s the limit. Infuse for 6+ hours in the fridge and enjoy with a straw or strained. I would like to know if you want to make these for resale how would you do it and would be wise to leave the herbs or fruits in it? Hi, Janice. That is a really tough question and one that I do not know the answer to. You would need to add some sort of chemical preservative if you wanted the infused waters to last more than three days, especially without refrigeration. I am sure it can be done as there are many unpasteurized fruit juices on the market today. 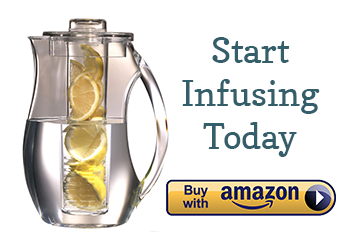 However, my goal with this site is help the average person make infused waters at home. I wish I was as entrepreneurial as you! You might do better to sell a kit, with an appropriate amount of high quality herb and a high quality drinking water, with instructions on how to make the infused water. My bf recently bought me a food dehydrator. I would sell the infusions almost as you would a tea. The dehydrated fruit/vegetables/herbs absorb water, going back to their original form and release their flavour at the same time. Hi Amy how long can I let the infused water sit ? If refrigerated? Do research on herbs first before creating your mixture. Rosemary can increase blood pressure. Mint blocks the absorption of iron.